FIU students won first and second at Boeing Titusville’s Bottle Rocket Contest. 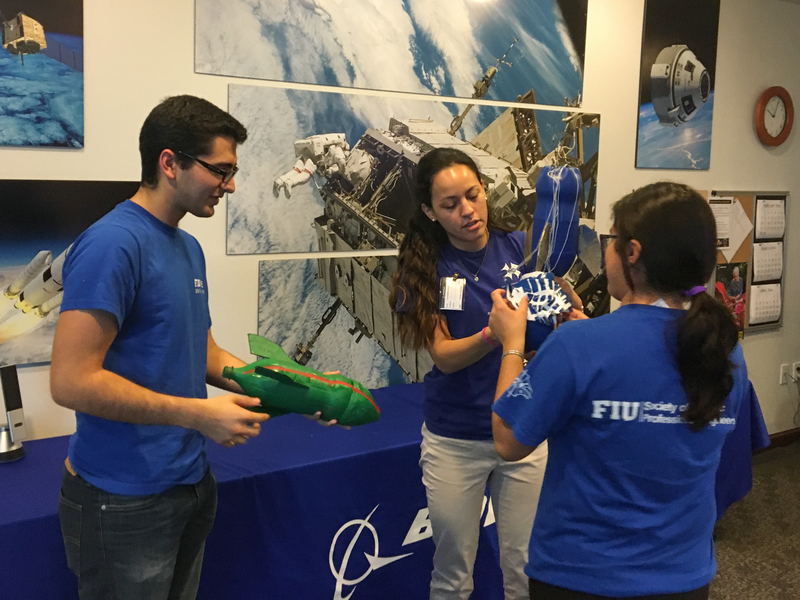 Students Jose Medina (left), Alexsandra Olaya (center), and Stephanie Forero (right) helped prepare their rockets for the launch. After joining the Aerospace Engineering Club, mechanical engineering major Jorge Cisternas realized he wanted a job in the aerospace industry. And recently, Cisternas, now the president of the club, got one step closer to his goal: he visited Boeing Florida Space Coast in Titusville and networked with professionals in the field. 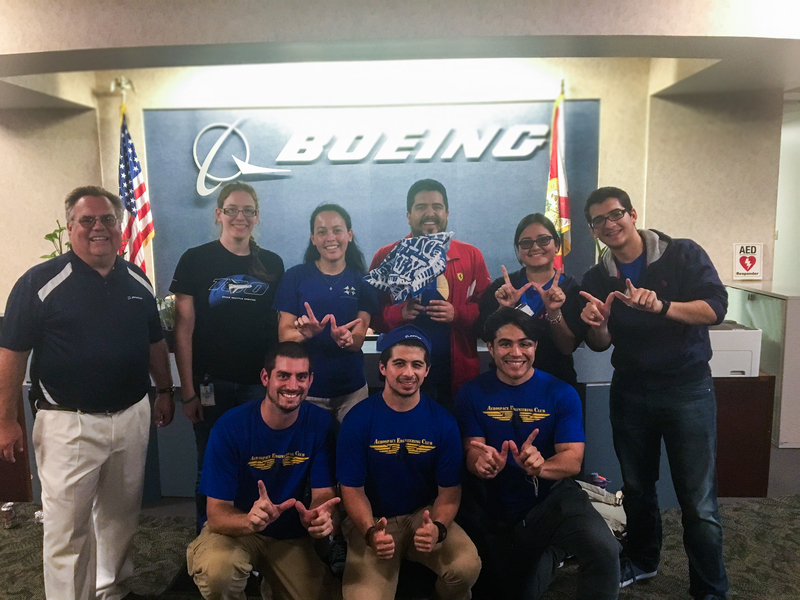 This week he and his fellow FIU engineering students left their mark at Boeing Titusville during the company’s annual Bottle Rocket Contest. Aside from winning first and second place, students also took a decisive step in establishing and strengthening a relationship with the company. For the first time FIU students – from Aerospace Engineering Club (AEC) and the Society of Hispanic Professional Engineers (SHPE) – were invited to attend the contest alongside students from the University of Central Florida, Florida Institute of Technology and Embry-Riddle Aeronautical University. Olaya had previously visited Boeing Titusville with several other SHPE executive board members after contacting Scott Southwell, Boeing Florida Space Coast Operations engineering director. She was glad to see Southwell mention he was very happy for FIU students to be part of the competition and give her a shout-out publicly. The competition, held during Engineers Week, combines a fun engineering challenge with a valuable networking opportunity to meet professionals at the company. Boeing Engineer Orlando Torres says FIU students were invited because the SHPE students made a great impression last year. The contest portion of the event involved designing a 2-liter plastic bottle rocket, filled with water and air, to have the longest-lasting flight-time in the air. Students could design up to two rockets. FIU’s two rockets won first and second place, both lasting more than 12 seconds in the air, and edging out the next-highest placing bottle rocket by about five seconds. Students also learned about the types of projects engineers at Boeing are working on, including designing the rocket that will take people to Mars. And they got to learn about different parts of the rocket and different products the company makes. A few lucky FIU students who arrived early got to see computer CAD models of various parts of the rockets such as the core stage of the rocket, where the engine belongs. The engineers even gave them the scoop about why some parts of the rocket are designed a certain way for increased performance. Cisternas enjoyed getting to immerse himself in the day-to-day life of engineers. Just one reason Boeing will keep FIU in mind for a while: on the last launch, one of the FIU rockets got blown into the tree outside Boeing’s front door. FIU’s bottle rocket still sits outside Boeing.